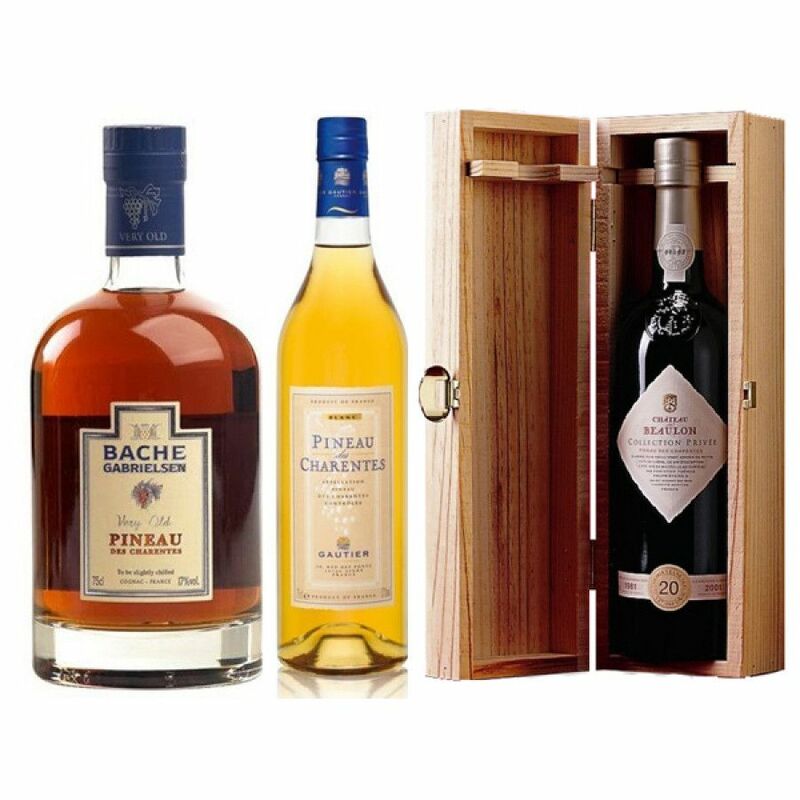 A wonderful set of three great Pineau des Charentes from three amazing cognac houses: Bache Gabrielsen, Gautier, and Chateau de Beaulon. Perfect to increase the depth of the drinks in your cabinet, or a wonderful gift for anyone who appreciates fine things. 1. The Bache Gabrielsen Old White Pineau has been created from Ugni Blanc, Colombard, and Folle Blanche grapes. This sweet blend of has been matured in casks for a decade, and thrills with aromas of nuts and dried apricots. A great accompaniment to good liver, desserts, or blue cheese. 2. The Gauter White Pineau. Aged for a minimum of 18 months, the youth and vibrancy of this golden nectar has so impressed that it won the Silver Medal at the Concours Mondial de Burxelles, Belgium, in 2010. Fruits, grapes, plum, and honey are just some of the taste sensations you'll enjoy. Enjoy chilled as an aperitif or with your favorite mixer for a refreshing long drink. 3. The Chateau de Beaulon Collection Privee 1982 Ruby 20 Years Old. Wow, wow, and wow again... A multi award winner, this super old pineau blends Merlot, Cabernet Franc, and Cabernet Sauvignon grape must with cognac for an elegant, full bodied drink sensation. Perfet with chocolate desserts, gingerbread, cinnamon, figs... In fact, try it in situations as an alternative to port. Tasting notes by Chateau de Bealon: Eye : Sumptuous copper gold robe. Nose : Vanilla-wood, exotic, toffee notes, mild cinnamon, fresh almond, pale wood on acacia honey base. Palate - very complex, peaches in rich syrup, almond. Long satisfying finish.